Proto speedster is marked by its fixed landing gear and dummy cockpit. 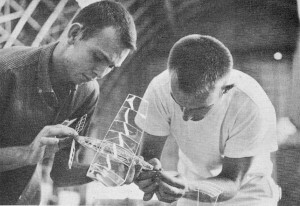 Tense moment comes during indoor event when fully-wound rubber motor is at­tached to removable tail boom. Fragile microfilm-covered, almost weightless transparent planes can be damaged by a healthy sneeze. 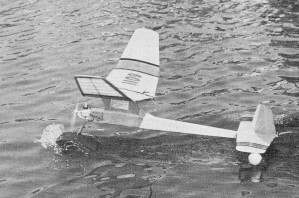 The "ROW" event is for float-equipped free flight gas planes which are supposed to "rise-off-water" under their own power. Georgia entry (below) utilizes ping pong balls. All the tricks of adjusting and trimming learned from glider and rubber jobs are employed in getting good performance out of a high powered free flight model. Climb in a steep wide open spiral and circling glide after power cuts is the usual flight pattern. Controlling the power in the climb and still retaining glide trim really brings out a modeler's skill at proper adjustment, or lack of it. 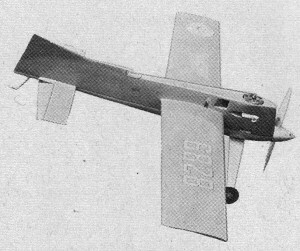 CONTROL LINE - The late Jim Walker really shook up model flying in 1940 with his early U-Control model flight demonstrations. Like most great inventions the U-Control idea was a simple one. Instead of chasing a soaring model cross-country... why not stand in one spot and let the model fly in a circle around you? 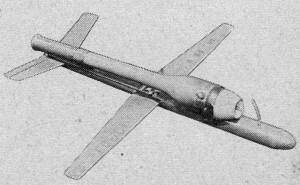 Few innovations in model flying gained such instant enthusiastic acceptance by modelers everywhere. 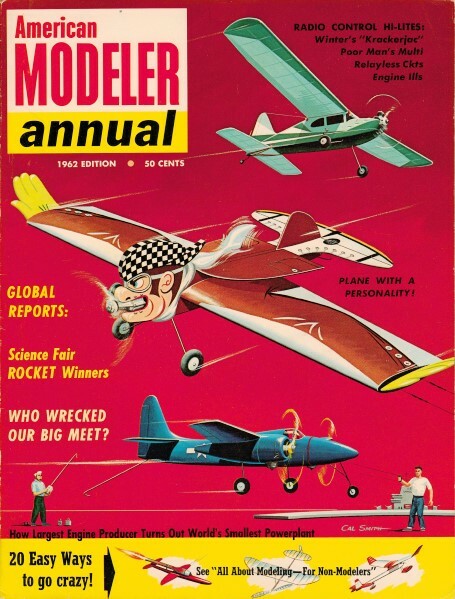 The effervescent Jim exhibited his first U-control models at the 1940 Nationals. 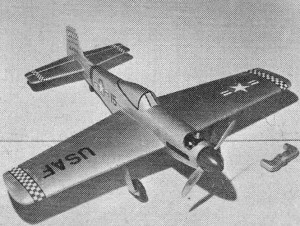 That first performance-packed "Fireball" puts a lot of today's control liners to shame, Powered with an ignition O&R 23 engine, the 3 foot span all-balsa Fireball was capable of speeds up to 75 mph, could do loops, fly inverted and land like a feather, With Its lifting (not symmetrical airfoil) it could be hand-launched with the U-Reely control handle and zero line length, then reeled out to fly in 100 ft. radius circles. Jim Walker and his Fireball set the pattern for practically all of the many phases of control-line flying as we know it today. Clipped wing Fireballs with big engines started speed flying. Lightened glow engine powered Fireballs could fly the stunt pattern - after all it's just a series of loops linked together in various combinations. Glider pickups, balloon busting, tail stands, flying three models in one circle... all these stunts first done by Jim have found their way into control line flying in one form or another. See today's Rat Racing, Combat and Precision Acrobatics. If the object of free flight flying is endurance (by pre-flight adjustment and design) the object of control line flying is the DIRECT CONTROL of the performance of the model during its flight by the flyer, The major factor in control line's popularity is the fact that flying can be done in a relatively small space as compared with free flight. There is no need for a wide expanse of open fields. Small 1/2A powered ships can be flown in a large backyard, The larger types flown on up to 70 ft. lines require at least the width of a football field for safety clearance around the circle. So instead of flying in the wide open spaces, modelers can fly control line closer to home, This unfortunately presents an entirely different problem - noise! Model flying and its attendant engine sounds close to residential areas are cause for complaints by the neighbors, so even control line flying is best done away out from the center of some towns. made by Sterling Models. Powered by .15-size engine (Dyna-Jet) for control line competition.